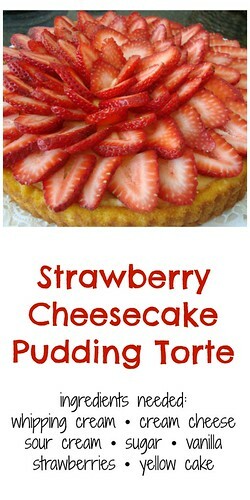 I made this dessert for Easter since my dad is a big fan of strawberry and cheesecake. It was a hit and perfect for spring! For the pudding, whip the heavy cream until stiff peaks form. Set aside. Mix the rest of the pudding ingredients until smooth. Fold in the whipped cream. Spread the pudding mixture over the top of the cake. Fan strawberry slices over the top. WOW! That is soooo gorgeous! I'm not brave enough to test out my decorating skills, yet, but as soon as I am I wanna make this. Gorgeous and you're right perfect for Spring! Oh wow Joelen, it's beautiful! It looks like it belongs behind the counter of a fancy French pastry shop - I bet it tasted heavenly too! Oh yum, this looks incredible! Wow! I think I know what I am making for the next family dinner. That is beautiful stuff. So inspired to make anything with strawberries right now.